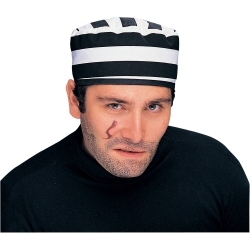 Traditional black and white striped convict hat. This hats stretches to comfortably fit a variety of head sizes. This hat is popular with our directors doing “The Producers” or as a quick and easy Halloween costume as an escaped convict by pairing it up with our fake shackles.